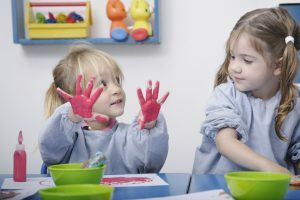 Gingerbread House Preschool and Nursery has been providing high quality education and care for children age 6 weeks – 6 years for nearly 20 years. It is our mission to provide an environment that utilizes age appropriate activities to enhance the cognitive, physical, social, and emotional development of all children enrolled. Gingerbread House Preschool and Nursery is owned by Cynthia and John Weidig and directed by Dezaray Baker. The highly credentialed staff at Gingerbread House have many combined years of experience in early childhood along with many combined hours in early childhood education coursework. Gingerbread House is proud to hold the Silver Circle of Quality awarded by Excelerate Illinois, the quality rating system in Illinois, that verifies that quality care we offer for all ages and the commitment we have to all the families and children enrolled in the facility.